First Lady Frances Wolf and Pennsylvania Secretary of Transportation Leslie S. Richards welcome you to a town hall to discuss the importance of women and diversity in the fields of transportation and public service. 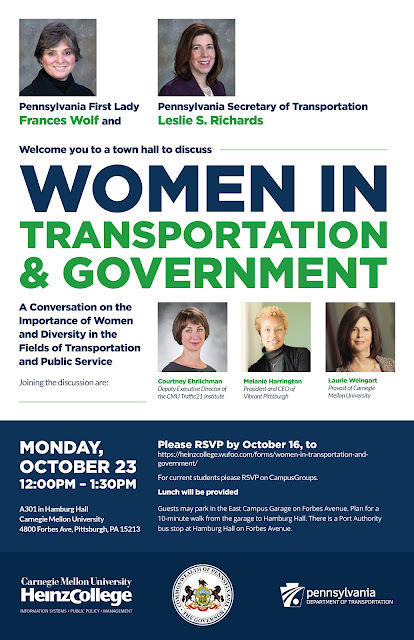 Courtney Ehrlichman, Deputy Executive Director of the CMU Traffic21 Institute will join the discussion along with moderator Melanie Harrington, President and CEO of Vibrant Pittsburgh. Laurie Weingart, Interim Provost of Carnegie Mellon University, will provide welcoming remarks. Join us in the conversation and ask your questions to the women who move us.